It’s loud, but there are lots of beers. It can take years of neglect and stains for a bar to look worn in. 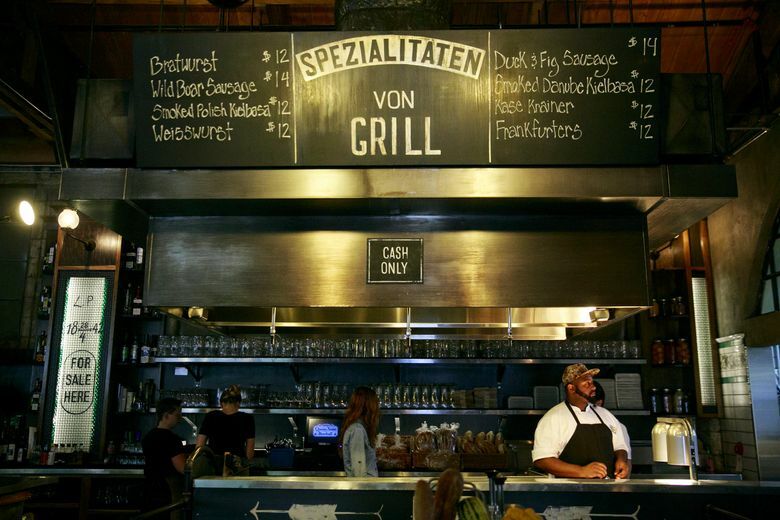 Queen Anne Beerhall had that patina when it opened last month. The investors spent some dough buying new furnishings and proceeded to rough them up, all to create the faux grime of an Old World biergarten. The spanking new white tiles were stained. The windows looked foggy, as if from decades of cigarette smoke. 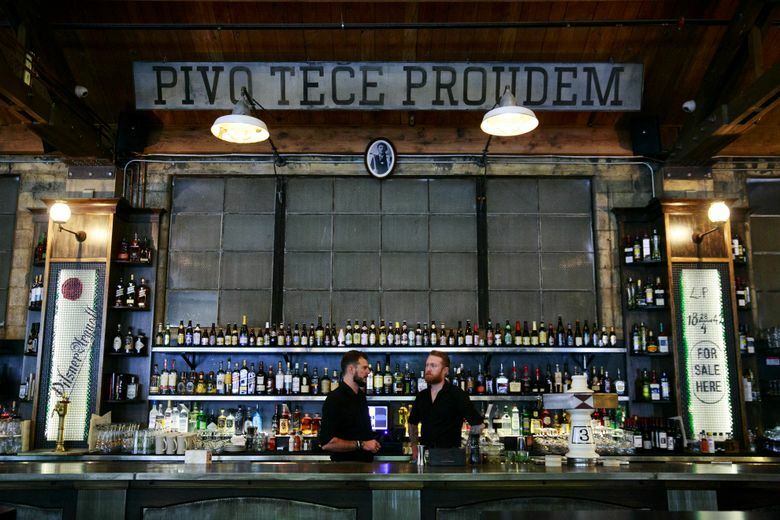 This marks the third beer hall that the two New York investors, Andrej Ivanov and Ladislav Sebestyan, have opened. They’re partnered with a local investor to oversee the Seattle location. Their other two locales are in New Jersey. Their bars follow the same blueprint. Take over a warehouse space. Scour antique shops for period pieces. Import Czech street signs and bring in a generally Central European motif to lend an air of authenticity. Add a zillion beers from Germany, Belgium and Austrian. Repeat. They may have gotten the aesthetics right, but they compromised on comfort here. The food options need explaining, which is difficult for servers when the decibels reach rock-concert levels. Here’s the deal: If you want to order a bratwurst, order at the grill station, pay and wait there. It’s cash only. Other food you order from your server. And yes, they take credit cards. This dual food system has caused all sorts of confusion and annoyance from patrons so far. 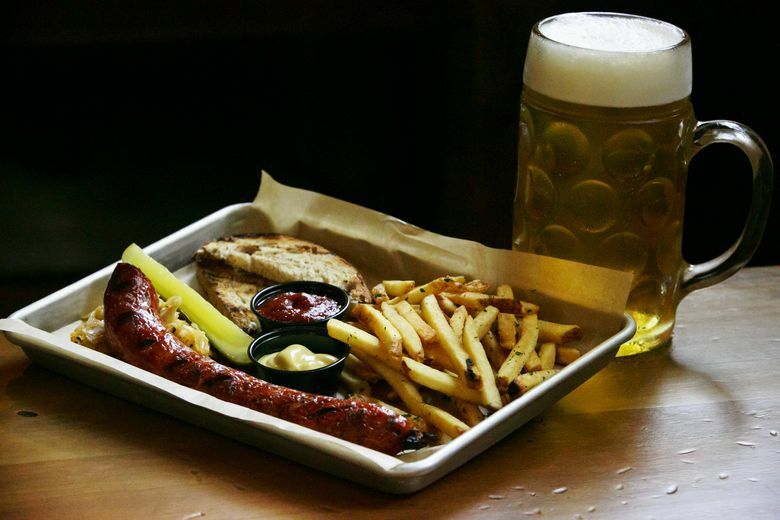 The idea of a walk-up bratwurst station is to create a festive, biergarten vibe by encouraging patrons to wander around this massive hall (7,000 square feet with outdoor patio and a stage for oompah, polka bands and other live acts.). The food, as described by the bartender, is “Austro-Hungarian cuisine with a Northwest twist.” It’s hit or miss. Just OK were a mediocre house-made charcuterie plate and an acidic venison tartare with crispy leeks. Better were sausages from the grill station — pork and game meat, stuffed and fatty enough for a juicy, snappy bite. Worth finding an ATM for. The impressive list of imported beer (60 different bottles and 25 on tap) is why this beer hall gets up to 400 patrons come evening. There’s a sour and oaky Rodenbach Grand Cru, a dry pilsner Kulmbacher and for hop heads, German IPA Braufactum Progusta made with Yakima hops. Queen Anne Beerhall gets as packed as the nearby Toulouse Petit, only it’s less of a meat-market vibe here. It draws techies, beer geeks and homeowners from Upper Queen Anne, a much better behaved crowd. 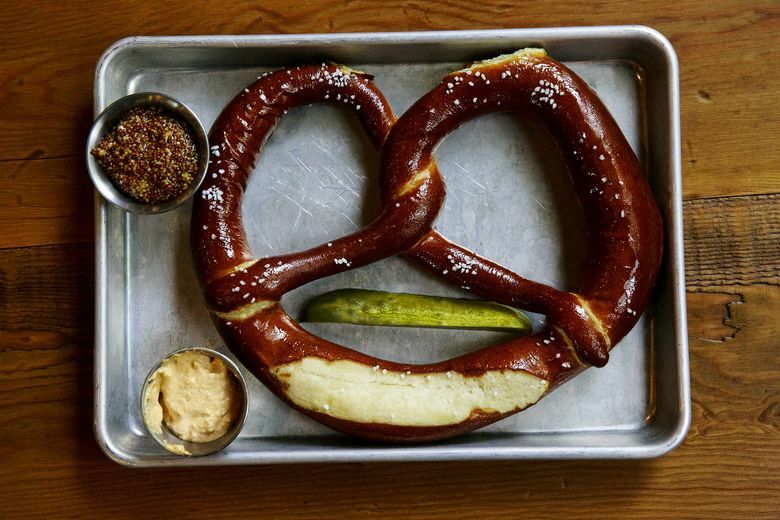 Queen Anne Beerhall, 203 W. Thomas St., offers happy hour 4-6 p.m. Monday-Thursday with $5 wines, $6 1/2 liter on select beers; there will be a rotating discounted menu (206-659-4043 or queenannebeerhall.com).